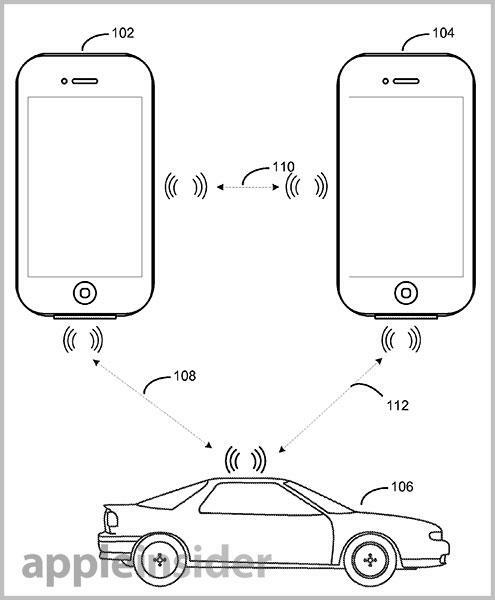 A pair of patent filings discovered on Thursday reveal Apple is actively investigating the possibilities afforded by the iOS mobile platform's various wireless connectivity options, including the ability to interact with, and at times control, a Bluetooth-enabled automobile. 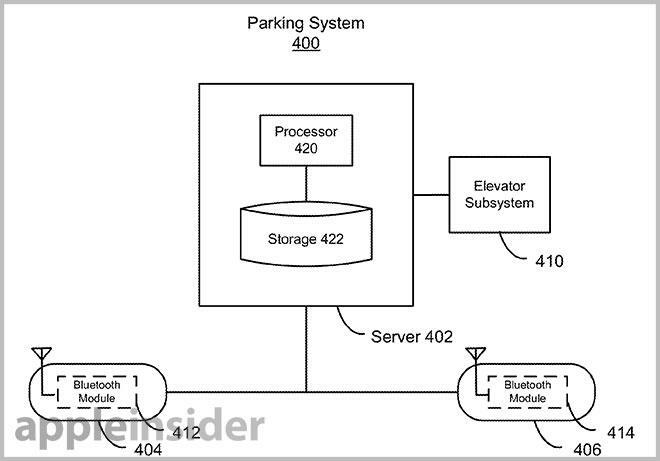 The two patents, published by the U.S. Patent and Trademark Office, describe Apple inventions for using an iOS device to find a parked car in a parking structure, getting guidance to said car, gathering parking fee information and, once near the automobile, activating vehicle functions like door locks, power windows and the engine starter. 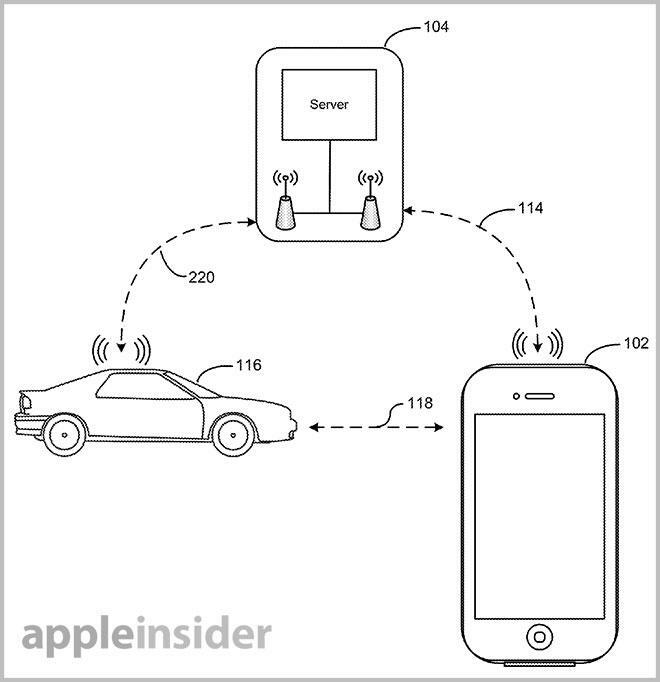 First, Apple's "Method for Locating a Vehicle" outlines a method in which a mobile device can pair with a vehicle via Bluetooth to determine whether it is in a parked state. If the condition is met, the handset then communicates with a wireless system within the parking structure to determine a parking location before moving away from the vehicle. When returning to the parking structure, the mobile device can access the parking structure's location system to request current positioning data. The received information is then compared to the vehicle location already stored on the device to determine a route back to the car. In another embodiment, the automobile itself communicates with the parking structure's location system, which logs the car's position and stores the data for later access by a mobile device. This method also allows the parking system to handle guidance and routing directions, which are subsequently sent to a handset upon request. 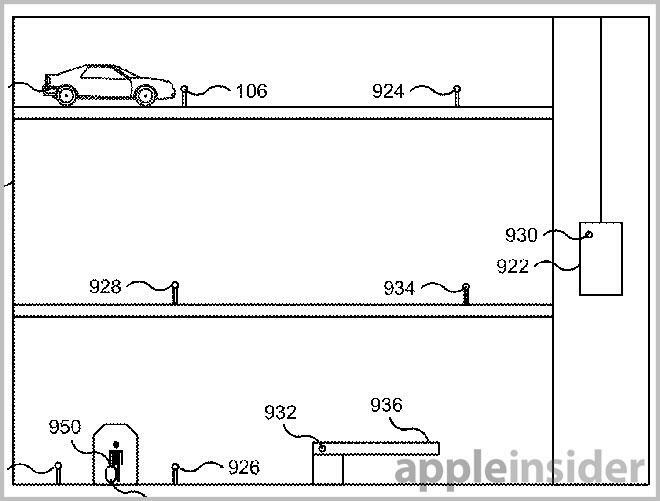 Digging deeper into the filing's language, Apple's invention calls for the parking structure to hold an array of wireless sensors that are deployed in such a way as to determine the location of a car and a mobile device. An example would be one sensor per stall, or one per row. The system can use Bluetooth technology to transmit positioning data, as well as guidance data if necessary, to the mobile device. Further, the parking system can also incorporate cameras, microphones and other sensors to determine whether a car is in a parked state. Such information would include an opened car door, active running lights or engine noise. In some embodiments, a user can manually inform the system that a car is parked by interacting with a digital interface either in the vehicle or on a mobile device. Regarding guidance, a handset can receive a map over cellular or Wi-Fi, which can have an overlay of current positioning data much like a GPS navigation system. Indeed, in some examples, GPS can also be used in concert with the parking structure's location data to determine a route back to the vehicle. As a side note, Apple recently acquired "indoor GPS" firm WiFiSLAM, which developed technology to serve up location data within structures where GPS signals are usually absent. Such systems could be implemented effectively in the utility filing described above. In Apple's second car-related patent application, titled "Accessing a vehicle using portable devices," a mobile handset pairs securely with a car over Bluetooth or other suitable method to control various onboard functions. The invention is basically a more intelligent replacement for existing automobile personalization systems offered by some manufacturers. These methods usually rely on key fobs, which interact with the car via NFC or radio to open doors, roll down windows, start the engine, and so forth. Instead, Apple proposes a mobile device take the place of a fob to offer enhanced control of the vehicle through wireless protocols like Bluetooth. 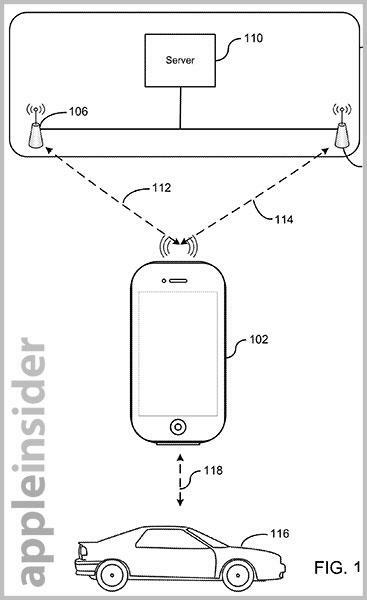 As noted in the filing, the system can support a primary and a secondary mobile device. Both would use proven authentication methods to access the vehicle, thereby allowing said devices to act as a security point in lieu of a key fob. A user can set preferences to cause the system to act automatically, or have greater control by requiring a PIN or passwords before a device unlocks and interacts with the car. Some embodiments allow restrictions to be placed on the second mobile device, such as authorization to start the engine only within a given time period, for example between 1 p.m. and 8 p.m. Further limitations can include speed, entertainment options, number of "uses" allotted and GPS-based fencing, among others. Besides describing the variety of functions available for operation, much of the patent application focuses on authentication techniques and device-to-car security. Apple is apparently looking to take advantage of popular "infotainment" systems a number of auto makers include in their vehicles, which usually carry some sort of wireless communications protocol such as Bluetooth. While it is unknown if and when the pair of patent applications will be used in a consumer product, a number of car manufacturers have already signed on to support Apple's "eyes-free" initiative. Both of the applications were filed in 2011 and credit Brian J. Tucker, Emily C. Schubert, Jess L. Dorogusker, Joakim Linde; Joakim and Stephen Chick as their inventors.